With 26 years of selling luxury real estate, Joanne Nemerovski has helped over 1200 families buy and/or sell their homes, representing well over $1 billion in luxury real estate. She has consistently been one of Chicago's top-producing realtors, specializing in the city's most desirable neighborhoods: Lincoln Park, the Gold Coast, River North, Streeterville, DePaul, and Lakeview. Within the first five years of her career, she was the youngest recipient of the "Founders' Award" for selling over $100 million in real estate. Unique homes gave her the title “mega broker of the Midwest” and just prior to joining Compass, for five years running she was the #1 producing individual agent for Berkshire Hathaway Home Services in the entire Midwest region. She is a regular contributor to articles in several business and industry publications, including Crain's and Chicago Magazine and Chicago Agent, and has received numerous awards from The Chicago Association of Realtors. In 2007, she was ranked simultaneously as the #1 agent at Koenig & Strey and the #2 agent at GMAC out of 22,000 sales agents nationwide. She has consistently been named one of Chicago’s elite top producers by the Chicago Association of Realtors each year, and in 2017 was once again honored by Luxe Home, Chicago Magazine, and Zillow as well as being the top broker at BHHS. 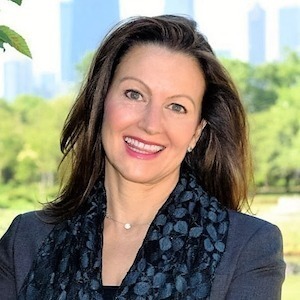 As a native Chicagoan and an active member of the Lincoln Park community, Joanne prides herself on her knowledge of the Chicago real estate market. In addition to selling, she has worked in all aspects of investment properties, including leasing, marketing and management Joanne continues to be exhilarated by her real estate career. She definitely offers her clients a personalized service approach and constantly strives to raise the bar on customer service.